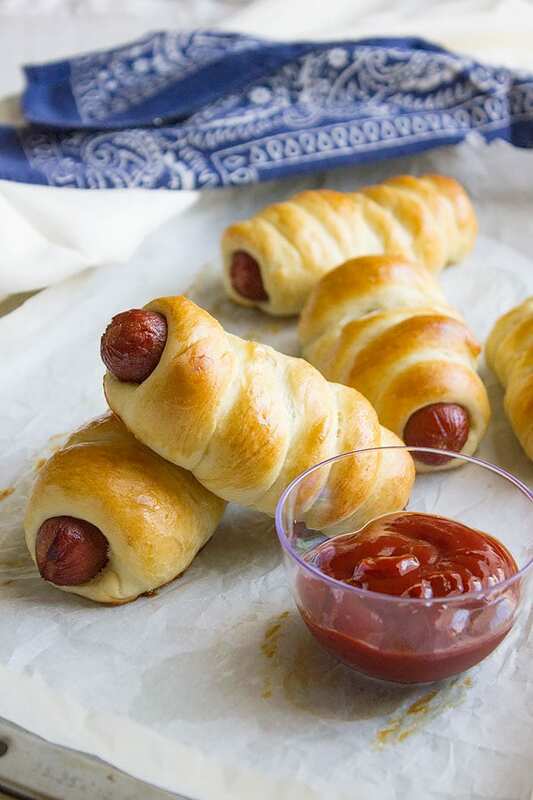 I love making these soft fluffy hot dog rolls for picnics! There is no mess, all you should do is pick a roll and use your favorite topping like ketchup or mustard, in fact, these rolls taste so good with almost any dip. The rolls are so soft and light. I didn’t use eggs when making these rolls and that makes its shelf life longer, however, since hot dogs are used, it’s better to store the rolls in the refrigerator. Something else to consider is the type of hot dog, some are very salty, in case you want to use salty hot dogs, add a little more sugar in the dough. Soft Fluffy Hot Dog Rolls. The soft fluffy hot dog rolls dough is very forgiving and easy to work with, almost perfection. You will not need to add more flour or even use a rolling pin, everything is done by hand and is so quick. This dough can be made a day ahead and kept in the refrigerator. To make the hot dog rolls using a refrigerated dough, take the dough out of the refrigerator and place it on a kitchen counter covered for one hour. 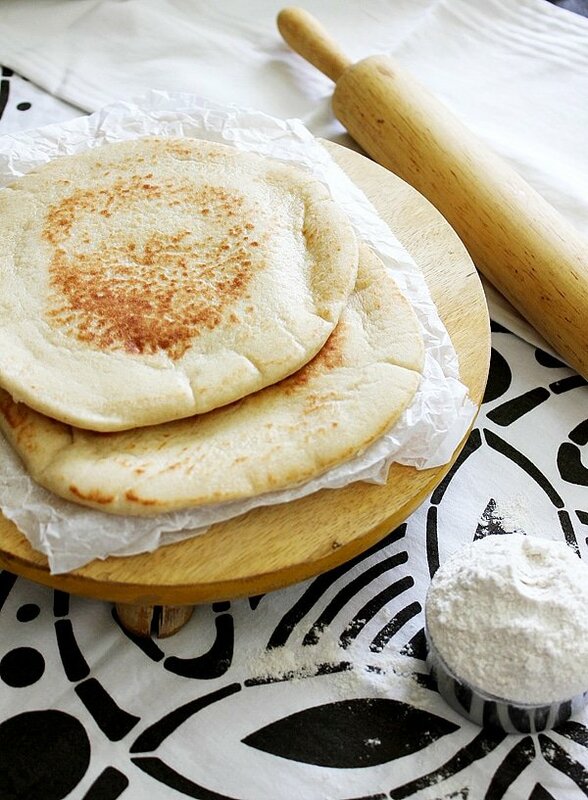 Knead the dough for one minute and then use it. Let it rise again for 20 to 40 minutes after wrapping it over the hot dog. Do not over bake, or your rolls will be dry. I hope that you enjoy these soft fluffy hot dog rolls as much as I and my family did! Let’s make them some Hot Dog Rolls! 1 cup all-purpose flour. shake the measuring cup when adding flour. ** 5 precooked hot dogs. Mix the water, sugar, and yeast and keep aside for 10 minutes. In a bowl, add all the ingredients including the yeast mixture (don’t add the hot dogs). Knead for 10 minutes until smooth. Place dough in lightly greased bowl, cover, and let it rise for 1 ½ hours to 2 hours. Knead the dough for 1 minute. Make 5 equal size balls. Place a parchment paper over baking sheet. Roll each ball into a log two times longer than the hot dog used. Wrap the log around the hot dog and place the end of the log under the hot dog and place on baking sheet. Cover and let rise again for 20 to 30 minutes. Preheat oven to 375F/190C. Bake for 13 minutes on the middle shelf of the oven. After it’s baked, brush with butter. Serve hot. This dough recipe looks amazing! 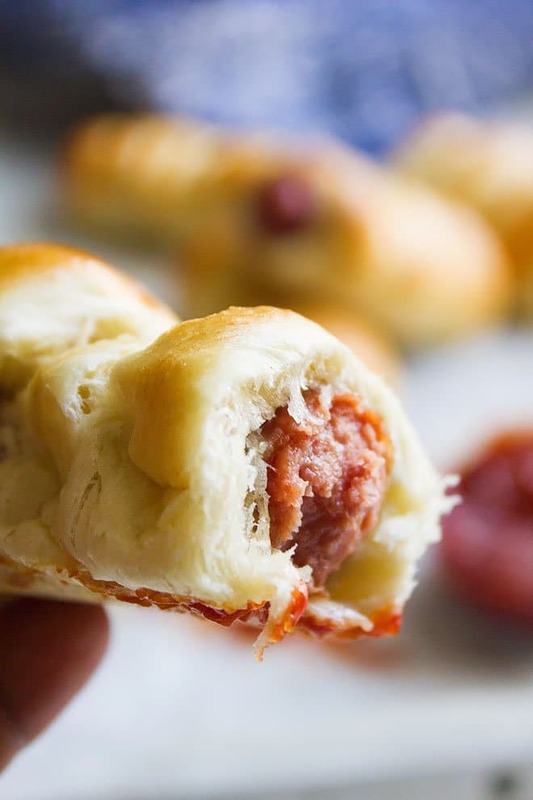 I definitely think the whole family could enjoy this fluffy hot dog roll serving idea! Nothing beats the fresh bread right out of the oven! These look really delicious. Ahhh! Those look so good. 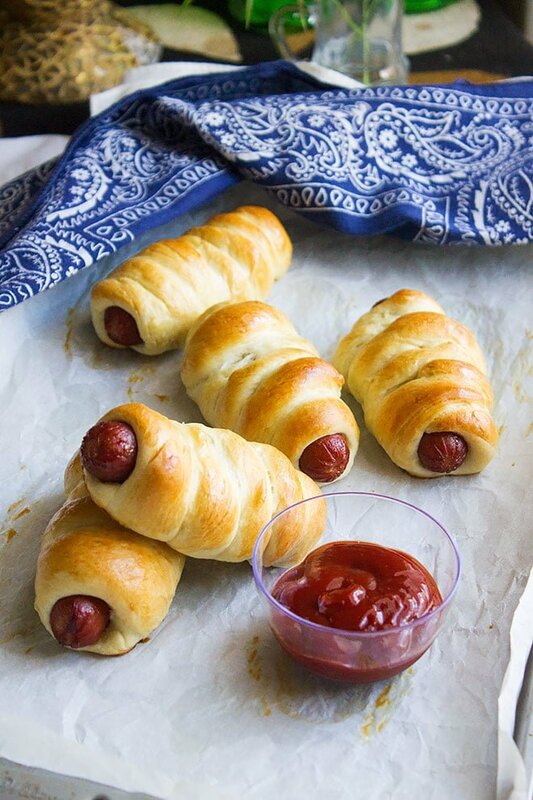 Pigs in a Blanket is my favorite finger food EVER. I can’t wait to make these. Om nom nom. I often find myself with hot dogs in the freezer with no buns! I will have to bookmark this recipe and try this. I love that you made your own buns VS the store bought crecents. These look fantastic! These have more flavor and stay fresh longer too. Ooh, this is a good one. I wouldn’t mind making these to go along with some other finger foods! Hey Liz! 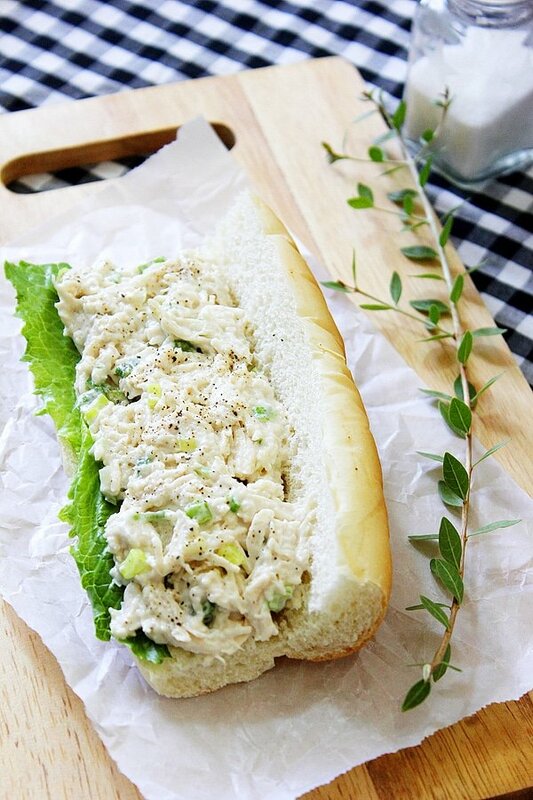 You will love how light and delicious these rolls are. Andddd I drool for these! These remind me of my youth, when my parents would drag me to parties and they had cocktail weenies. I would entertain myself with those! hahaha! OH! My kids would LOVE these! They look so fluffy! My mom used to make something similar when we were growing up! I haven’t thought about them in ages. My kids would love these! This is so convenient. It’s way better than having to carry hot dogs and buns, and it is less messy. What a great recipe idea. These look delicious! They’re perfect for the summer and I love the idea of taking them on a picnic. We plan to have many of those this summer! 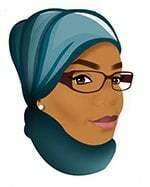 If you tried this recipe, do let me know how you liked it. We love these pigs in a blanket (that’s what we call them) here at our house. That is the best way to eat a hot dog in my opinion. These look so tasty. Indeed, no mess and so convenient! 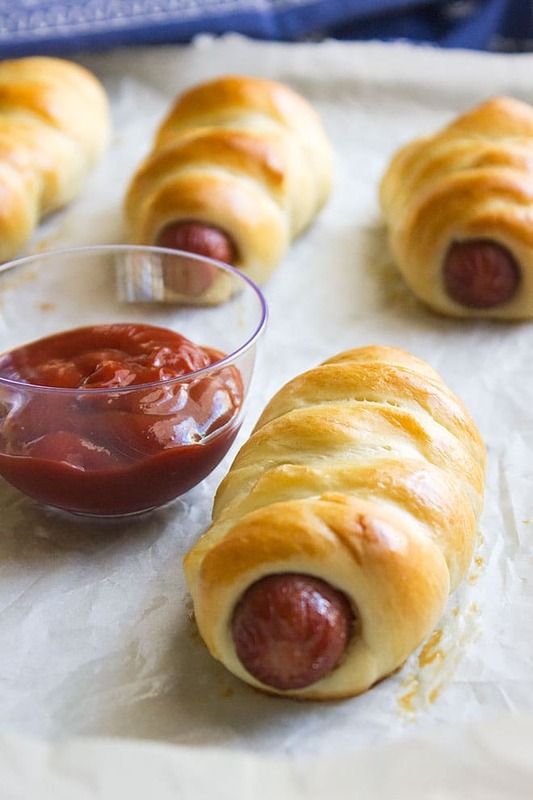 These soft fluffy hot dog rolls look so delicious and easy to make. I will have to get the ingredients I need to make some this weekend. I know these are going to be a big hit with my kids. They are so yummy and I have everything I need to make some already. 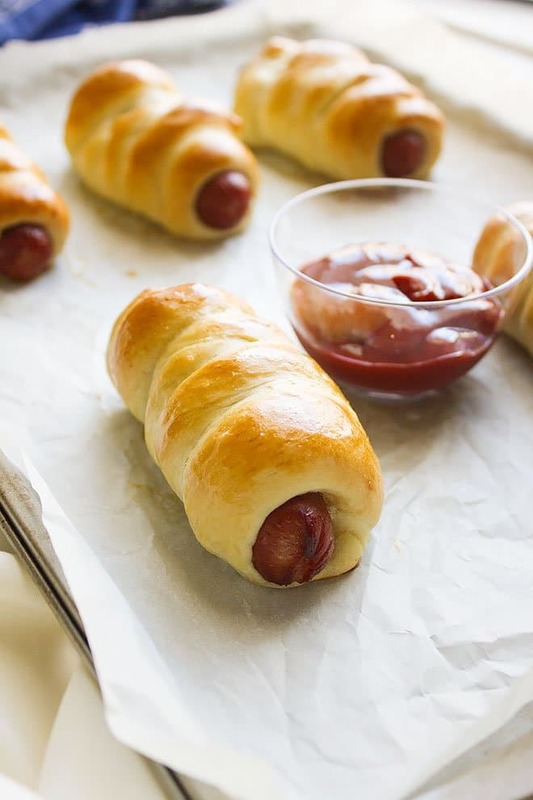 Ooooh, I love pigs in a blanket and using such a lovely recipe to make them is just brilliant. I will have to try this the next time I see my nephews. These look like the perfect after school snack! And I love that they look so easy to make! Oh, these look so good! I love baking bread, and NOTHING beats fresh baked bread in general. Pigs in a blanket with freshly made bread blankets?! WIN! You are so right Natasha, I love home baked bread and rolls they always taste better than store bought. My family would love these. The rolls look so delicious and fluffy. These wouldn’t last long at my house. I swear my son would live off of hot dogs if he could. I love making these. I’ve never actually made them from scratch like this though. I’m glad I can use this recipe now. I’ve had mini versions of these dogs, but not full-size! And not from scratch! i love it! tried to make these recipe and it tured out so great!!!! 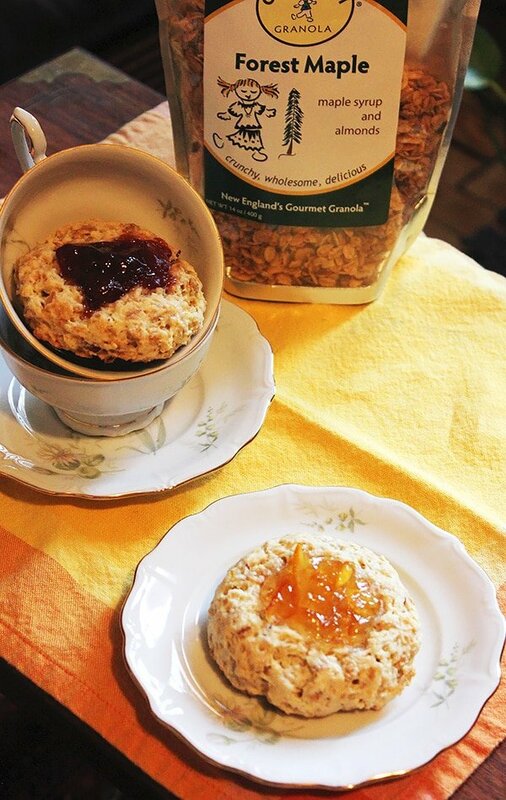 this recipe is so easy and simple but delicious!!!! crunchy on the outside and soft in the inside!!!! thank you so much!!! Can I fry it instead? Hi I tried your recipe and it was easy enough but mine turned out pale from the oven. My husband said that’s because I didn’t egg wash the surface before sending them to the oven. Do we need to egg wash first? Don’t see it in your recipe. Also, possible for me to add more sugar to make the bread sweeter? Hi Dee, Thanks for your comment. Some ovens do not distribute heat evenly and some have fans, and it affects the color of the cake and other pastry. Some use the broiler after the baking is done to add the light brown color to the pastry. You can brush the rolls with milk or eggs. It is ok to add a little more sugar to the dough.